Der Artikel Christoph Willibald Gluck (1714-1787): Iphigenie auf Tauris wurde in den Warenkorb gelegt. 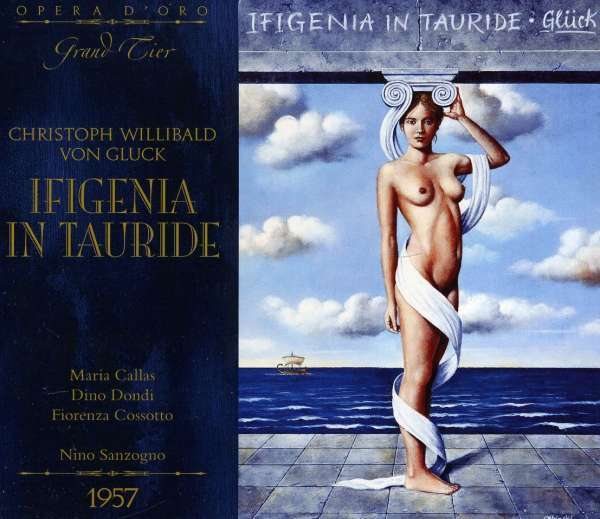 The recent rebirth of interest in the masterpiece of Christoph von Gluck’s maturity, Ifigenia in Tauride, has proved that his art can still cast a powerful spell over audiences. For a long time, Orfeo ed Euridice was the single work by Gluck to keep a toehold in the repertory. It was during this period that Maria Callas undertook two adventurous forays into Gluck’s operas atLa Scala Orchestra: Alceste in 1954 (under Carlo Maria Giulini) and, in June 1957, Ifigenia in Tauride. These were, in fact, the only two productions of Gluck in which Callas participated—and that during some of the most pivotal years of her entire career, as the true scope of her artistry was gaining widespread recognition. 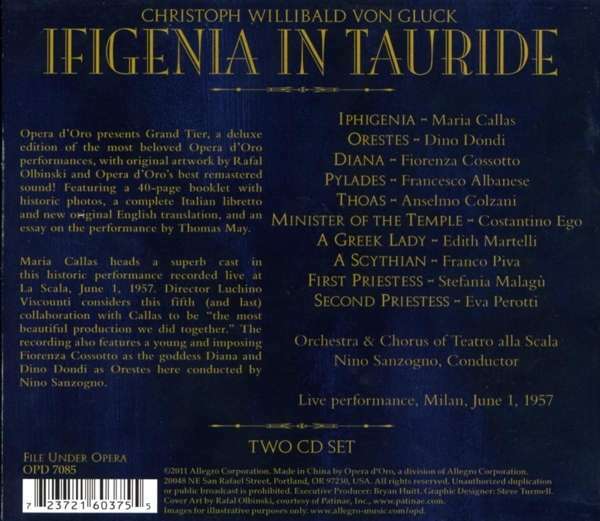 As for the beleaguered Greek heroine, Callas gave only four performances of Iphigenia for the 1957 production, which concludedLa Scala Orchestra’s season. Its opening night is the basis for this recording. Live performance, Milan, June 1, 1957. Features original artwork by Rafal Olbinski, re-mastered sound, extensive booklet with historic photos, and complete libretto newly translated for this release. Hörprobe Track 7: Ciel! mi perseque dei Numi il furor! Ciel! mi perseque dei Numi il furor! Hörprobe Track 13: Oh silenzio feral! Hörprobe Track 14: Oh de'misfatti miei, Numi, autori fatali! Oh de'misfatti miei, Numi, autori fatali! Hörprobe Track 15: Perchè di tanto affanno turbar colui che t'ama! Perchè di tanto affanno turbar colui che t'ama! Hörprobe Track 19: La calma torna nel mio cor! La calma torna nel mio cor! Hörprobe Track 23: Sommi Dei! Tutti estinti i cari miei! Sommi Dei! Tutti estinti i cari miei! Hörprobe Track 5: Oh celeste gioir! Hörprobe Track 7: Che! Non saprò domar resistenze funeste? Che! Non saprò domar resistenze funeste? Hörprobe Track 8: Ah, qual pietà! Hörprobe Track 9: Che! Me stimi salvar la desiata morte? Che! Me stimi salvar la desiata morte? Hörprobe Track 12: Io t'imploro anelante, o implacabile Dea! Io t'imploro anelante, o implacabile Dea! Hörprobe Track 13: Sii, Diana, a noi propizia! Sii, Diana, a noi propizia! Hörprobe Track 14: La forza m/ abbandona, o condanna crudel! La forza m/ abbandona, o condanna crudel! Hörprobe Track 16: Sommi Dei, sommi Dei, soccorso a me! Sommi Dei, sommi Dei, soccorso a me! Hörprobe Track 17: Non evocar immagini funeste! Hörprobe Track 18: Sventura! Ahimè! Disvelato è il mistero! Sventura! Ahimè! Disvelato è il mistero! Hörprobe Track 20: Várrestate e s'ascolti il mio parlar! Várrestate e s'ascolti il mio parlar!